A Menorah Judaica Necklace made in Jerusalem, Israel. Judaica are religious icons representing the Jewish religion. The Menorah is a seven branched candelabrum and has been a symbol of Judaism for 3000 years and was originally used in the ancient Holy Temple in Jerusalem. 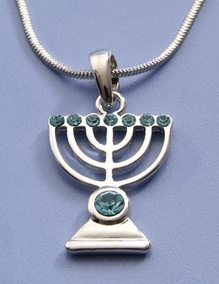 The Menorah is one of the oldest symbols of the Jewish people. It is said to symbolize the burning bush as seen by Moses on Mount Horeb (Exodus 3) and it lit by Olive Oil.